On 22 June, the European Commission adopted a new strategy mapping out the EU’s relationship with China for the next five years. The paper, entitled "Elements for a new EU strategy on China", identifies key opportunities for the relationship between Europe and China, having a special focus on creating jobs and growth in Europe as well as promoting a greater opening up of the Chinese market to European business. As reported in the official press release of the EU Commission, such opportunities include "concluding an ambitious and comprehensive agreement on investment, a Chinese contribution to the Investment Plan for Europe, joint research and innovation activities, as well as connecting the Eurasian continent via a physical and digital network through which trade, investment and people-to-people contact can flow". Moreover, as underlined in the Strategy, the "EU should build on the launch of the new Legal Affairs Dialogue which first took place in June 2016 focussing on e-commerce and consumer protection online. Then EU should continue to pursue dialogues with China on standards, regulation and conformity assessment procedures in key sectors in order to reduce costs and entry barriers, and to promote the primacy of international standards in areas such as health and safety, pharmaceuticals, environmental protection, food and consumer product safety, climate action and data protection." Additionally, the European executive body stated that "looking further ahead, broader ambitions such as a deep and comprehensive Free Trade Agreement can be considered once an ambitious investment agreement between the two sides has been concluded and reforms that level the playing field for domestic and foreign companies have been implemented. In this regard, China must make significant, time-bound and verifiable cuts in industrial over-capacity, notably in the steel sector, to prevent negative consequences from unfair competition. Further strengthening the effectiveness of the EU's Trade Defence Instruments, notably through the swift adoption of the Commission's Trade Defence Instruments modernisation proposal of April 2013, is key. 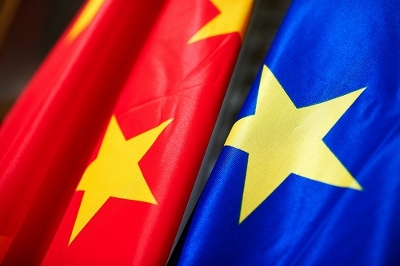 The EU will continue to support China's economic and social reform programme through its many dialogues with China so that the country can reap the full benefits of market-led reform, including by eliminating state-induced economic distortions and reforming state-owned enterprises." In the following weeks the Strategy will be presented to the Council and to the European Parliament.